South China Botanical Garden, Chinese Academy of Sciences (SCBG, CAS), formerly known as the Institute of Agriculture and Forestry, Sun Yat-Sen University, was founded in 1929 by Chen Huanyong (Woon-young Chun), a renowned botanist and academician of CAS. It was renamed South China Institute of Botany, CAS in 1954, and then to its present name in 2003 in accordance with CAS developmental plans. As one of the most important botany research institutions in China, SCBG has obtained abundant research achievements in the fields of ecology, systematic and evolutionary botany, plant resources, biotechnology, landscape and gardening. Since 1954, approximately 335 monographs such as Flora of China, The Vegetation of Guangdong, Studies on the Tropical and Subtropical Degraded Ecosystem and Its Rehabilitation, Rare Plants of China, and Introduction to Restoration Ecology have been published. From 1978 to 2010, over 1150 papers were published in international journals indexed in SCI, including two highly prestigious journals, Nature and Science; 369 research achievements have been obtained, of which 264 were awarded prizes at various levels, including a first prize and a second prize National Natural Science Award and five second prizes of the National Science and Technology Advance Awards. The research achievements were twice honored as "Top Ten Basic Research News in China" in 2000 and 2006, respectively. 98patents have been filed, of which 49 have been licensed. As one of the largest gardens in China, SCBG is composed of three divisions: 1) a nursery and exhibition zone, viz. the arboretum, occupying an area of 282 ha. It was designed mainly for plant ex-situ conservation with more than 13,000 plant taxa grown in over 30 specialized gardens, including magnolias, bamboo, palms, gingers, orchids and medicinal plants; 2) a research and residential zone, covering an area of over 37 ha. 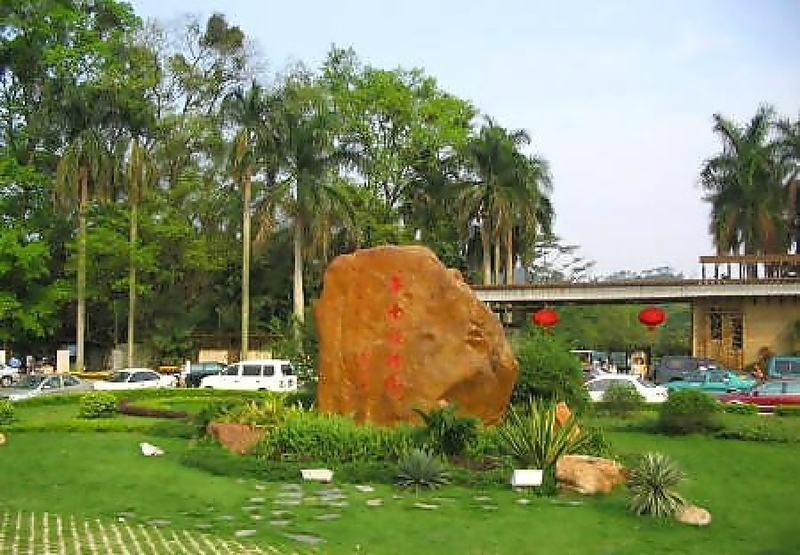 It features a herbarium conserving more than 1,000,000 plant specimens and a state of the art laboratory complex; and 3) Dinghushan Nature Reserve, which was established in 1956, the only reserve of CAS and the first national nature reserve in China. The total area of the reserve is 1,155 ha, where over 2,400 plant species are under in situ protection. In addition, SCBG runs several field research stations, including Dinghushan National Field Research Station of Forest Ecosystem, Heshan National Field Research Station of Forest Ecosystem, and CAS Xiaoliang Research Station for Restoration of Tropical Coastal Degraded Ecosystem. At present, there are about 410 staff members in SCBG including over 280 professional researchers. There are 318 graduate students in either Ph.D.(119) or M.S. (199) programs.The Ph.D. or M.S. degree is conferred in the fields of botany, ecology, and biochemistry & molecular biology, while the M.S. can also be conferred in ornamental plants & gardening, and biological engineering apart from the three fields above. There is also opportunity for postdoctoral training and the present number of postdoctorates is 20. The research fields of SCBG include: 1) Global change and ecosystem service; 2) Environmental degradation and ecological restoration; 3) Plant systematic and evolutionary biology; 4) Biodiversity conservation and sustainable utilization; 5) Agricultural food quality and safety, and phytochemical resources; and 6) Sustainable use of plant and gene resources. At present, there are 30 research groups associated with the 6 research fields. In the past decades, SCBG has established productive exchange and collaboration programs with research institutions in dozens of countries, with the number of exchange scholars close to 100 each year. During the period of 2002-2010, SCGB successfully organized 12 international conferences including Symposium on Theory of Ecosystem Succession and Practice of Ecological Restoration, Third International Conference on Vetiver, Symposium on Theory and Methods of Carbon Equilibrium and Circulation in Ecosystems, International Symposium on Artemisia and its Allies, BGCI China Program Workshop, Second International Symposium on Family Magnoliaceae, and 23rd New Phytologist Symposium: Carbon Cycling in Tropical Ecosystems. Approximately 1,000,000 visitors from home and abroad visit the SCBG every year. In tune to national strategic objectives and the frontiers of science, SCBG will further carry on fundamental, strategic and cutting-edge basic research projects in restoration and rehabilitation of degraded ecosystems, systematic and evolutionary botany, conservation and sustainable utilization of plant resources, as well as landscaping and horticulture. SCBG is also striving to integrate popular science education with tropical and subtropical plant research, species conservation, and sustainable resource utilization. SCBG is beginning the steps towards becoming a world-class botanical garden.